How Do You Play Keno? - Casino Answers! 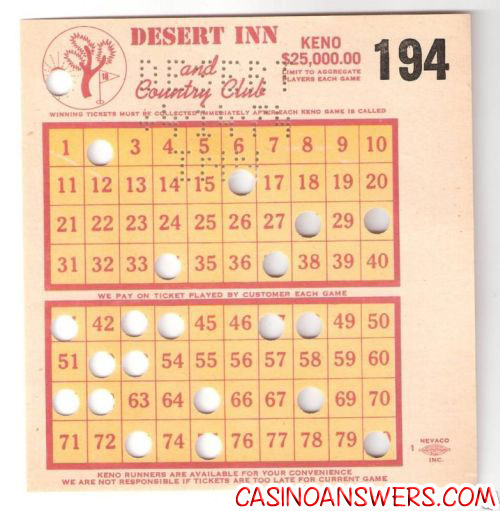 Casino Answers » Keno » How Do You Play Keno? Playing Keno in a live casino or keno lounge can actually be a daunting task. Online Keno? Super easy. Pick numbers. Click a button. Rinse, wash, repeat. But what about Keno in places like Atlantic City and Las Vegas? That’s what this article deals with – how to play Keno in a live casino. If you’re looking for how to play keno online, I have a separate article for you in regard to that. You can see it here: How To Play Keno Online. We should also note that casinos will usually hand out Keno booklets with any special rules or promotions they have in regard to Keno. So be sure to ask if they have one first, and if they do then read through it thoroughly. Also mark how much you wish to play per game, and how many games you wish to play. Then indicate how many numbers you have selected. All of this is indicated in the above card. Once this is done, take in your filled in Keno ticket to the keno writer at the counter, or even better give it to one of the people who are walking by collecting keno cards. These people are known as keno runners. In return you will receive a ticket showing the numbers you marked, and the amount bet. Now you can sit back and listen to the numbers be called, or watch the keno board light up. Once this is done if you won, then hand in your ticket to a keno runner or take your ticket to the keno counter. That’s how you play Keno. Thankfully it’s not that complicated when you play keno online – select your numbers then get lucky! If you’ve never played keno at all before, we’d advise trying one of the online casinos listed below or one of the keno games listed above. These casinos and games are available to play for free so you can essentially practise keno before playing it live. Is there a difference between 40 ball keno and 80 ball keno? The game itself will play the same so don’t worry about that. What will change of course is the quantity of numbers available, the quantity of numbers called, and then the payouts based on the number of keno numbers that you pick. The fundamentals of the game of keno remain the same however. Keno Beginners Guide? How to play Keno? Keno for Dummies? Is there a complete idiots guide to Keno?